Every time I told someone I was going with a group to spend a few days in Yuma, I got a negative response: an eye roll, a laugh, or “Why?” Conventional wisdom is that there’s not much to see or do in this small city on the Mexican border, despite the fact that it claims to be “The RV Capital of the World.” I had been assured by the group’s organizer, however, that such was not the case. Let me say first that there is—truly—nothing but desert between Chandler, where I live, and Yuma. Fill up your car with gas, because there aren’t many opportunities to stop along the way. But, once in Yuma, there were a surprising number of interesting places to visit…and we did. Our first stop was at the Garden Café, in the small downtown section of the city. After lunch, we only needed to walk next door to our first attraction, the Sanguinetti House and Gardens. It’s a museum and event venue today, but it was originally the home of E.F. Sanguinetti, who came to Yuma at the age of 15 and is now considered one of the founders of the community as it is today. His story was interesting, and the house and especially the gardens were lovely to see. For dinner we were on our own, so a couple of us decided we wanted to go to Lutes Casino. It’s a restaurant, not a casino, and we never did find out why it has that name. But, we did find out it is an interesting place to see and to have a meal. One of their specialties is a potato taco, which is a potato-filled corn tortilla, rolled and deep fried with shredded cabbage, tomato, mayo and Cotija cheese. I wouldn’t want it as a steady diet, but I’m glad I tried it. Besides, I was so distracted by the ambiance of Lutes that I hardly knew what I was eating! The next day was our only full day in Yuma, so it was filled with activities. 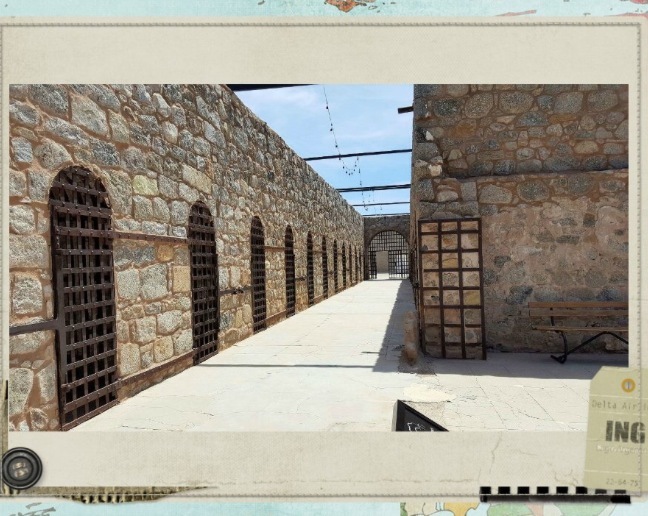 Our first stop was the Yuma Territorial Prison. I think most people have heard about the prison, which was an important place in the late 19th Century, when it was built. A total of 3,069 prisoners, including 29 women, lived within its walls during the prison’s thirty-three years of operation. Their crimes ranged from murder to polygamy. Our docent was excellent and gave us a real feel for the history of the place. He emphasized that the prison was a model institution and was administered very humanely. I wonder if the prisoners felt the same way! His enthusiastic interpretation of the prison’s story captured us, and we all enjoyed our time there. Our next stop was the Cocopah Tribal Museum. I will admit there was some grumbling as we caravanned our way out there; it was a long way over a very dusty road. 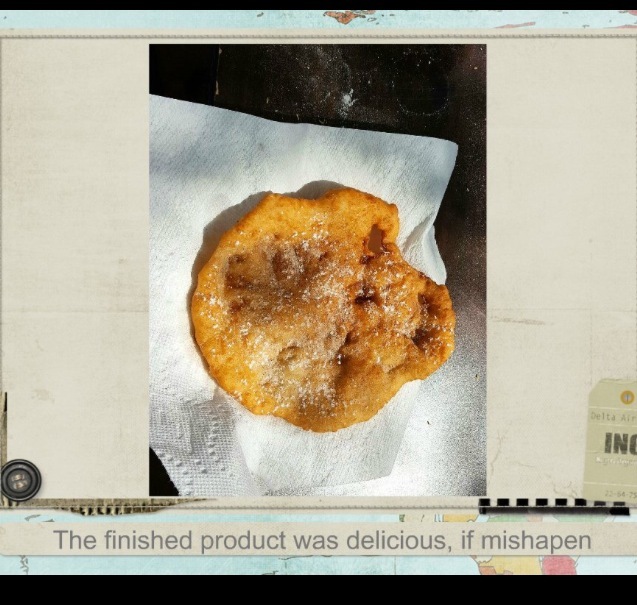 We had been assured that, in addition to a tour of the museum, we were also going to be treated to some fry bread. (In case you haven’t noticed, eating is an important activity with this group.) The museum was wonderful, quite small but well curated, and we all learned a lot from the exhibits and our informative guide. Once our indoor tour was over, we were escorted to an area outside, where a small fire was burning and tables were set up for us. Ahhhh, time for fry bread. But, we were surprised to learn that we would be making our own treat! What? I don’t know how to make fry bread! I don’t really know what fry bread is! No worries, they had done this before. Each of us was given our own small bowl, and our hosts brought around flour, shortening, sugar, salt to put in our bowls. We mixed with our fingers, kneaded it a bit, stretched it into awkward shapes, and then into the hot oil it went. What emerged didn’t look great but it tasted so good. We were proud and happy as we sprinkled our bread with powdered sugar and cinnamon. It was definitely one of the best parts of the trip. Our last activity of the day was a stop at the Quartermaster Depot. Again, there’s lots of interesting Arizona history involved with this army post that, as the name suggests, was the storage facility for everything that came into the territory for all the military installations in the vast area of Arizona. By the end of our tour there, we were all hot and worn out. It was time to go back to the hotel. That evening we were taken on a culinary tour of Yuma. We stopped at three different restaurants as a sort of progressive dinner. The last course was at a beautiful country club, where we ate outdoors and watched a gorgeous full moon rise. 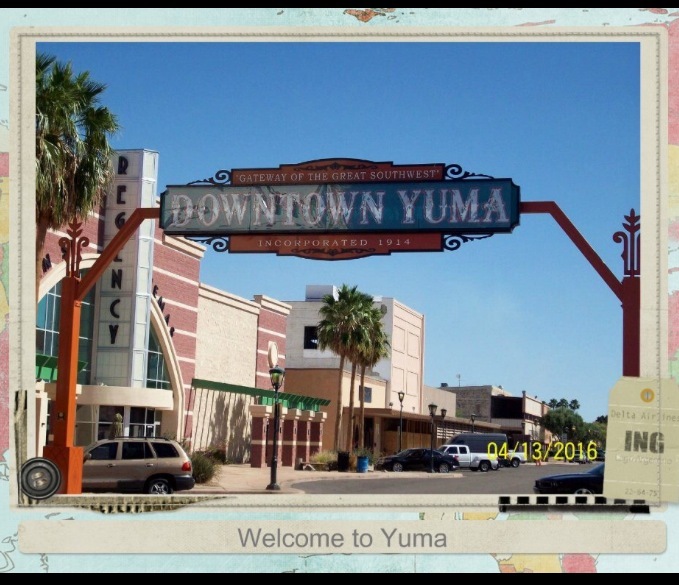 Yuma is trying to make a name for itself as a culinary destination and we were happy to experience what it has to offer in that regard. Our last activity was the following morning, before we all headed back home. A group of us went on a bird walk at the Eastern Wetlands. A local member of the Audubon society was our guide, and we saw some lovely scenery and interesting birds. It was a nice end to a lovely trip. 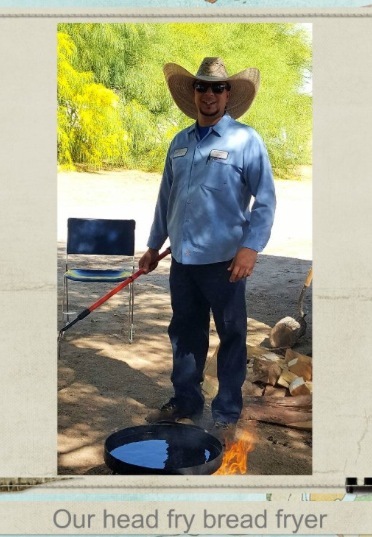 Meanwhile, one member of our group did what many, many folks do when they visit Yuma. She took a trip across the border to take advantage of the much discounted prescription drugs. She reported that the prices were good, and the pharmacy was modern and impeccably clean. She took a peek into a couple of dental and vision facilities, too, and said they were equally welcoming. I guess that’s one reason so many seniors spend their winters in RVs in Yuma. So, while I don’t need to go to Yuma every year, I enjoyed the trip and highly recommend a visit. It’s another piece of Arizona history that’s worth studying.